Atlanta has to be in the top 10 worst cities in the United States for homeless people. In my opinion, San Diego is the worst city because they keep finding innovative ways to make life hell for those without housing, but Atlanta is up there. There are some huge decisions coming for City leaders in Atlanta, but based on past decision making homeless people are going to suffer. Atlanta has had progressive Mayors for years and is the home to the King Peace Center, but cannot seem to get it together to unify leadership around an effective strategy to deal with poverty and homelessness in the region. Here is the write up from the National Low Income Housing Coalition "Notes from the Field:"
The Atlanta City Council unanimously approved an ordinance on July 18 to address homelessness over the next three years. Invest Atlanta, the city’s economic development authority, will issue a $26 million Homeless Opportunity Bond in an effort to make homelessness “rare, brief, and non-recurring.” This legislation culminates four years of work by the United Way of Greater Atlanta, Partners for Homes, and the City of Atlanta. The bond will finance activities targeted to homeless families and youth, chronically homeless individuals, and families at risk of homelessness. The City Council approved an initial bond of $26 million with agreements from local non-profits to augment the city’s investment. The United Way of Greater Atlanta committed $26 million in matching donations, and Invest Atlanta will leverage $66 million in public resources to be used in conjunction with the bond, raising the total public-private partnership investment to more than $115 million. The United Way and the City of Atlanta aim to end veteran homelessness by 2017, chronic homelessness by 2019, and youth homelessness by 2020, and the bond, together with the additional funds, are essential in meeting this goal. Together, the City of Atlanta and its partners plan to place 500 chronically homeless individuals in permanent supportive housing, secure permanent housing for 300 homeless families, and prevent 100 families from entering homelessness. They will also create 264 new emergency shelter beds and 254 new housing interventions for homeless youth by 2020. 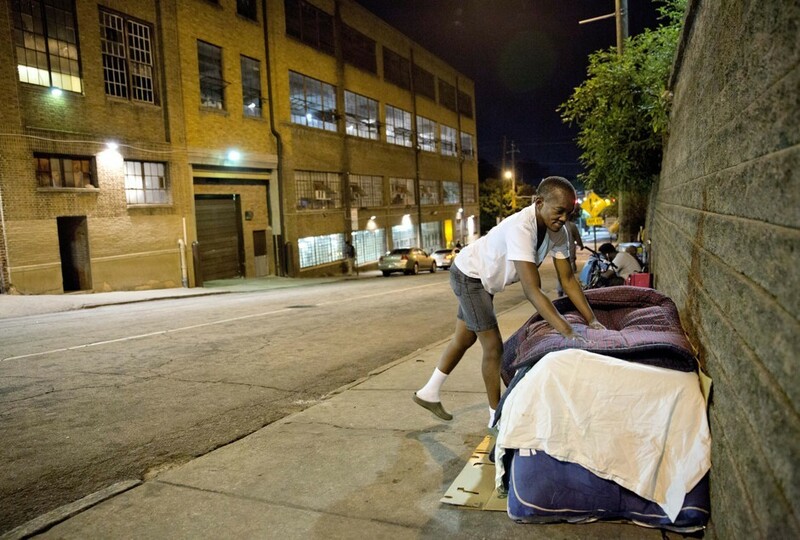 In the last four years, the City of Atlanta has made strides in tackling homelessness. HUD reports that since 2013, the number of unsheltered homeless individuals in Atlanta decreased by 52%, chronically homeless individuals by 61%, and homeless veterans by 62%. The lack of affordable housing, however, leaves many at risk of homelessness. According to NLIHC’s 2017 Out of Reach report, Georgia renters must earn $14.25 per hour in order to afford a modest one-bedroom apartment and $16.79 per hour for a two-bedroom apartment. In the Atlanta metro area, these numbers are even higher: renters must earn $16.50 to afford a modest one-bedroom apartment and $19.04 for a two-bedroom apartment. The minimum wage in Georgia is $7.25 and the average renter wage is $15.61; both fall short of what renters need to keep rent and utilities under 30% of household income. The new Homeless Opportunity Bond is a significant investment towards providing housing for the thousands of Atlanta residents experiencing homelessness. Chronic housing poverty – extremely low income renters paying so much for their housing that they cannot afford other necessities - puts thousands more at risk of homelessness. I attended the US Social Forum in Atlanta in 2007 and have regular contact with Anita Beaty who ran the huge shelter down in Atlanta until earlier this year. She and her group have basically been attempting to bring justice to City through three administrations. The City has gone down the path of most other cities in shutting down public housing, reducing the number of affordable housing units available, and eliminating access to emergency shelter. Here is an article in the Atlanta Journal Constitution about Anita and her decades of work protecting homeless people. The shelter has been under threat for a dozen years over a water bill and health issues. Anita and her volunteers just want to provide a place inside for anyone who comes to the door. She never wanted to hang up the sign the Peachtree-Pine shelter that there is "No Room at the Inn." At the end of August, the Business Improvement District in the neighborhood will take over the shelter and stop taking new residents. Then by November 1 the main shelter in Atlanta will close down the building and the 1,000 people who use the Peachtree/Pine shelter will have to find another place to live. As Atlanta enters the colder months of the year, they are going to have to find places for a significant number of fragile, disabled, those struggling with addiction, and men and women who cannot find a job. There will be no overflow in the area and just like Cleveland, Atlanta has shuttered hundreds of shelter beds over the last eight years. Whenever I look at other cities in America, it makes me so glad that we still have a commitment to try to house everyone who comes to the door. The above article indicates that the City is building new facilities to be ready by 2020 while the crisis is coming in November 2017. I hope that the guys can hold out on the streets for three years while the new shelter is prepared. Also, don't believe any of the numbers in the above article. The HUD Count is completely bogus; conducted by untrained volunteers with a different method in every city. It is a one night count that has no relevance to the rest of the year, and attempts to count an extremely mobile community who by their nature attempts to stay out of sight. Finally, building housing is expensive, and in a hot real estate market like Atlanta the $26 million will probably build enough housing for 150 people. There are hundreds of homeless people who need help in Atlanta. There will be tons of people waiting for a shelter bed once the city stops taking people into the Peachtree-Pine shelter. Winter is coming to Atlanta.